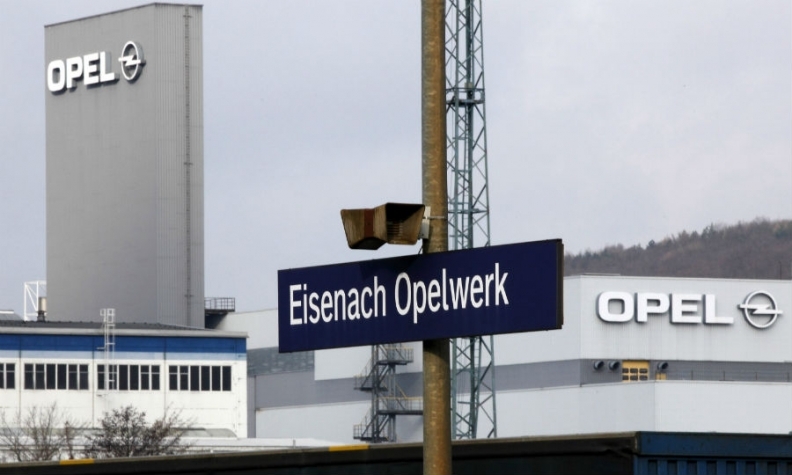 FRANKFURT -- German labor leaders fear Opel's Eisenach factory could lose half its 1,800-person work force unless a deal is struck with owner PSA Group over working conditions, amid escalating tensions between German union IG Metall and Opel's management. Opel's German sites have been excluded from PSA's sweeping investment plans in Europe because Opel's management wants concessions to raise the plant's profitability as a precondition for getting more production allocated to the Eisenach plant. Opel's works council, backed by the powerful IG Metall, has rejected Opel management's demands for concessions on pay, arguing these run counter to earlier pledges to honor an existing collective wage bargaining agreement. Germany accounts for about half of Opel's 38,000 staff, while 4,500 are in Britain, where Opel operates as Vauxhall. German worker representatives on Thursday said the Eisenach plant's future was under threat if only one new model was allocated for production there in the long run. "The current offer is for one vehicle to be produced in Eisenach which means that between 700 and 1,000 jobs will be cut back," Wolfgang Schaefer-Klug, head of Opel's works council, told Reuters on Thursday. "This is equivalent to a halving of the workforce," he told journalists outside Opel's headquarters in Ruesselsheim, western Germany. "This is about the existence of Opel, its jobs and its plants," IG Metall representative Rudolf Luz told Reuters. The union demanded PSA commit to investment plans that go beyond 2020. "Until now, [PSA Group CEO] Tavares has offered us nothing," Luz said. Opel currently builds the Adam minicar and Corsa subcompact in Eisenach, according to Automotive News Europe's Guide to European Assembly Plants. Corsa production is due to move to Zaragoza, Spain, next year and be replaced by the successor to the Mokka SUV. Without a deal to make Eisenach more competitive, Opel's management is refusing to guarantee production of a model, based on a PSA Group EMP2 platform, to replace current models built on platforms engineered by Opel's previous owner, General Motors. This new model is likely to be the Grandland SUV, sources have said. Opel CEO Michael Lohscheller said management had made an offer for investment in Eisenach and Kaiserslautern that was better than current deals struck under collective bargaining agreements. "The precondition for these offers is that we are competitive," Lohscheller said in a message on Twitter. He told a town hall meeting held at Opel's headquarters on Wednesday that profitability was improving, but added: "In part, our factories were twice as expensive as PSA factories." His comments were first reported by German weekly WirtschaftsWoche and were confirmed on Thursday by a source familiar with what he said. Opel, which PSA bought from General Motors for $2.6 billion, has made losses for almost 20 years, and Tavares has been frustrated in his bid to cut high production costs.